Puzzle Facade « Adafruit Industries – Makers, hackers, artists, designers and engineers! Puzzle Facade brings the experience of solving a Rubik’s cube to the urban space. 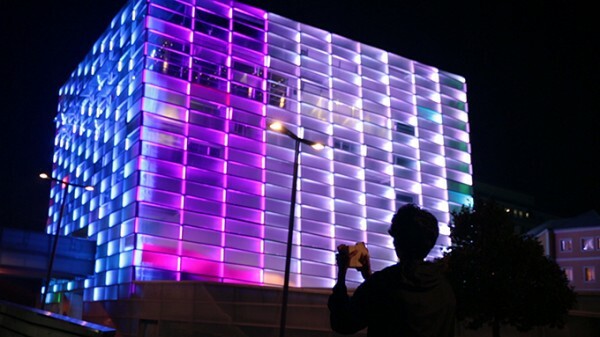 It transforms the Ars Electronica’s media facade (Linz, Austria), into a giant Rubik’s cube. In Puzzle Facade the player interacts with the specially designed interface-cube. The interface-cube doesn’t have color stickers and it holds several electronic components (an Arduino Pro Mini, an IMU, a LIPO battery, rotary encoders..) on its inside that allow to keep track of its orientation and rotations. This data is sent over Bluetooth to a computer that runs the Puzzle Facade designed software. This software visualizes the cube on the large-scale Ars Electronica’s media facade according with the interaction of the player with the interface-cube. More about Puzzle Facade here.